Marvel Eco Build has been created by people with extensive knowledge and experience of both the United Kingdom and European construction industries. For many years we have specialised in External Wall Insulation (EWI) systems, Renderings and Renovations and have a detailed understanding of material tolerances and building and construction regulations. The Marvel Eco Build team is fully trained and certified by Weber - the manufacturer of a comprehensive range of EWI systems. 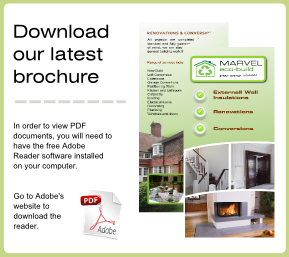 Marvel Eco Build always strives to achieve the best quality results in every aspect of our work. All of our services and supplies used are certified by the British Board of Agrément. All of our work is fully insured, which assures our clients complete peace of mind that in the unlikely event of something going wrong they are fully covered.